Fish are animals and aggression is a part of the life of any animal. Some animals are more aggressive than others, including fish. Check out 16 of the Most Aggressive Animals. 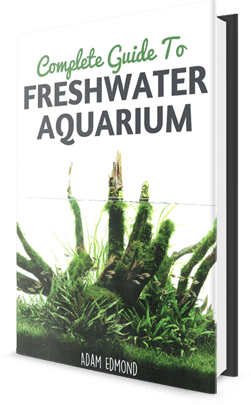 It is very important to know which fish species are aggressive and how to avoid disastrous combinations of keeping fish in the same tank resulting in the death of multiple fish. Aggressive freshwater fish may receive a poor reputation by some people due to a bad experience, prejudice, or not enough knowledge about fish behavior, requirements, and suitable tank mates. That’s why it is important for you to know the different type of aggressive freshwater fish. Why are some fish aggressive or semi-aggressive? Animals live on instinct and the law of survival of the fittest still applies in the animal kingdom. Aggression is a behavior that is developed throughout the evolution of the fish species and can develop even in the most peaceful species of fish; the conditions fish live in may dictate whether the fish will become aggressive in order to survive. Harsh environments and lack of food can lead to developing aggression needed for survival. Aggression occurs when fish are feeding, mating, or simply defending their territory. Just because a fish is aggressive, fish enthusiasts may still keep them. Even the most aggressive freshwater fish are beautifully rich in color and when keeping with suitable tank mates can be part of a great aquarium. Goliath tiger fish, vampire tetra, snakehead fish, peacock bass, giant wolf fish, alligator gar, Arowana, and Piranhas, especially the red belly and black piranha. These are voracious carnivores favoring a meat-based diet. 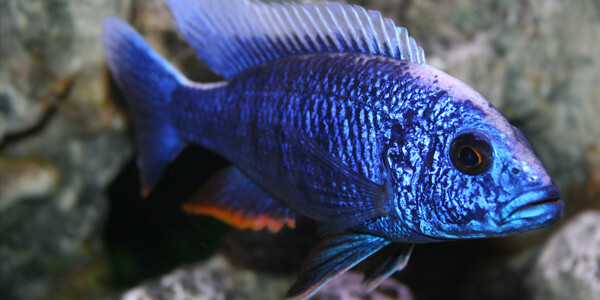 Most cichlids are aggressive, territorial, bite, kill, and eat or fight other cichlids and fish. Yet, there are some types of peaceful cichlids that are considered good parents and they aggressively defend their offspring. African Species Jewel cichlid (Hemichromis), Frontosa (Cyphotilapia frontosa), Tetracanthus (Neolamprologus tetracanthus), Lemon cichlid (Neolamprologus leleupi), Five-barred cichlid (Neolamprologus tretocephalus), Nyassa peacock (Aulonocara nyassae), Malawian eye-biter (Dimidiochromis compressiceps), Malawi golden cichlid (Melanochromis auratus), Melanochromis johannii, Cobalt blue cichlid (Pseudotropheus socolofi), and most Mbunas cichlids are considered semi-aggressive, but there are also aggressive ones. German ram (Mikrogeophagus ramirezi), Angel fish (Pterophyllum scalare) are considered peaceful except during spawning, the beautiful Discus fish, Agassiz’s dwarf cichlid (Apistogramma agassizii), Dwarf shell-dweller (Neolamprologus brevis), Two-spot cichlid (Cichlasoma bimaculatum), Severum cichlid (Heros severum) are relatively calm, except during spawning, Redheaded cichlid (Cichlasoma synspilum) is fairly well behaved with other species despite its large size (11 inches) provided it respects its territory. 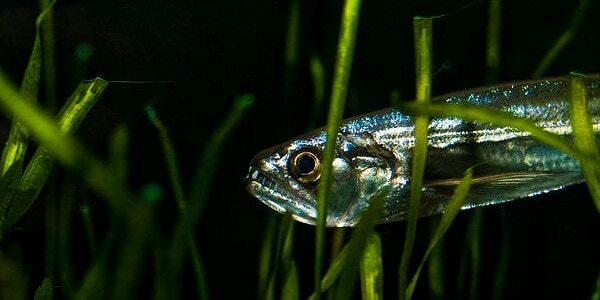 These small schooling fish that nip the fins of long-finned fish and males are aggressive towards females when mating. Male Betta fish are very common small fish that behave quite aggressively towards each other and will fight one another to death. Also, a male will fight with a female to the death unless the two are mating; however, when mating is finished, they should be separated. A school of female Bettas can be kept with one male safely. These fish will bully smaller fish, fight with one another, and nip fins. The many types of fish labeled as aggressive is due to research and fishkeeping experience. It is very important to be informed about the types of fish categorized as aggressive and how to avoid bad situations if you keep any of these species. Creating the optimal environment such as space and complementary tank mates can create balance even within a tank filled with aggressive predators. What’s your experience with aggressive freshwater fish? Comment and share with us. Unfortunately, I bought a CAE ( Chinese Algae Eater ), never thought it will be aggressive when it become old. I am planning to separate it from the rest of my fishes! Yes Chinese algae eaters are very aggressive and can live with oscars, convicts, frontosa, red devil Cichlids, Texas Cichlids, you name it. When they get big they are very tough and mean fish that will kill non aggressive tank mates and eat them. They are catfish. My Dark blue chiclid also killed my goldfish. I’m planning to get fish that will be kept in the same tank. This really helped me, I was thinking of getting two tiger barbs. But maybe not any more…. Hi what’s the meanest thing I can get for my tank? piranhas r pretty boring been looking at snakeheads. Want something that won’t let me put my hand in the tank. Putting a tank together 55 gallon. I want aggressive fish that can be in the same tank. My last tank the red devil killed everything including green terror Jack Dempsey convict and a few others. What’s OK to out in with an aggressive red devil? Hey Dave! It depends weather it is a female or a male. Females can live with members of their on species but males can not. Other south american cichlids could be good too! Cichlids are actually not aggressive when put with the right other fish! You have to know what is right for your fish. 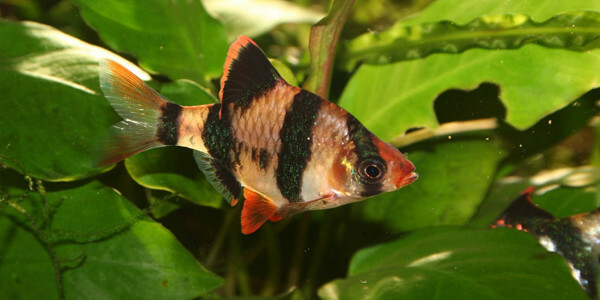 This also goes for tiger barbs, they are amazing fish for a 6-9 on aggressiveness in your tank (10 being really aggressive). I am 13 and have had a school of tiger barbs in my tank for around 2 years now and they are fine! I have a rating of 7 on aggressiveness in my tank. If you can’t do cichlids or tiger barbs, cherry barbs is a great way to go too!